Currently going viral on the Twitters is this photo series from a Reddit user who drew a very lucky name in that site's MMO secret Santa. 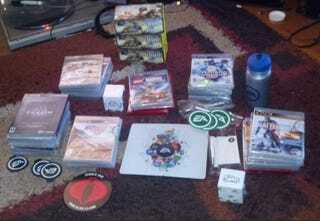 Apparently an Electronic Arts employee decided to make it a Christmas he'll never forget, sending more than two-dozen games and a bunch of other EA swag. See, they're not the worst company in America after all!